Taipei, Taiwan August 12, 2011 – An industry pioneer and continual innovator, Thermaltake is the leading performance brand in PC thermal solutions, a worldwide designer and supplier of high-performance components to the e-Sports hardware market, with “delivering the perfect user experience” as the optimized mission. 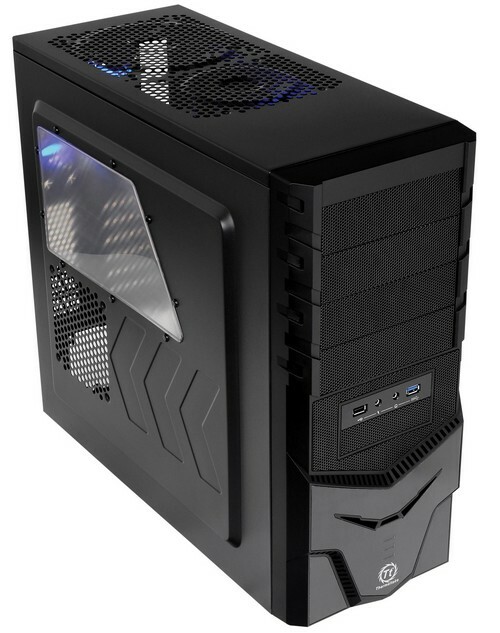 With a design perfected through an revolutionary sense of style, highly exclusive appointments and cutting-edge technology, the extensively updated Thermaltake 【Spacecraft VF-I】mid-tower chassis is now available since mid August, 2011. The new Thermaltake 【Spacecraft VF-I】mid-tower chassis embodies the unique design for eSports look and feel, that encourage space addicts to explore cyberspace with endless possibility, together with an external USB 3.0 connection, the water cooling support for internal 240mm radiator; it is designed especially for Micro-ATX and ATX motherboards, also it now benefits from the impressive ventilation performance of the “HDD” , “CPU “ and “VGA” Air Cooling Systems. In terms of the unique mechanical design and enhanced thermal system of the【Spacecraft VF-I】mid-tower chassis, it is a great alternative for DIY users of all levels. Allowing for flexibility, easy maintenance and upgradeable possibilities, the advanced features make the new 【Spacecraft VF-I】mid-tower chassis be an accessible e-Sports chassis in the market. Thermaltake devoted to create an exciting and fascinating user experience and a more personalized lifestyle for the users and gamers. The design concept of the 【Spacecraft VF-I】mid-tower chassis can be breakdown into “Space” and “Craft.” As “space” is the major concern when it comes to what could be equipped in a chassis, the Thermaltake spaced the interior of 【Spacecraft VF-I】mid-tower chassis to facilitate the installation of all mirco-ATX and ATX with the ability to attach one of our prime CPU cooler the Frio OCK for maximum expansion possibilities. It will also supports the most advance AMD & NVIDIA® graphic cards up to 12.5” long (i.e. nVidia GTX 590 & AMD HD6990). Moreover, 【Spacecraft VF-I】mid-tower chassis provides massive storage capability with 4 x 5.25”, 6 x 3.5” and 1 x 2.5” HDD/SSD bays. Featuring the intelligent layout and engineered interior, Thermaltake also crafted the exterior together with an aluminum front bezel and explicit aerodynamic design which conditioned the Spacecraft VF-I the capability to proceed through and be recognized in the dark-space with a distinctive space style. The appealing 【Spacecraft VF-I】mid-tower chassis boosts the imagination of the gamers when adventuring in the fascinating games. Thermaltake revolutionizes the PC market by create, innovate and implement the most efficient solution in its technology. The【Spacecraft VF-I】mid-tower chassis supports up to 7 fans for superior airflow and maximum airflow efficiency ranging from 80mm to 120mm bearing. Utilizing the chassis’s smartly water-cooling ready design, the【Spacecraft VF-I】mid-tower chassis can be easily transformed to accommodate high-efficiency 24cm radiator to increase more powerful cooling ability. 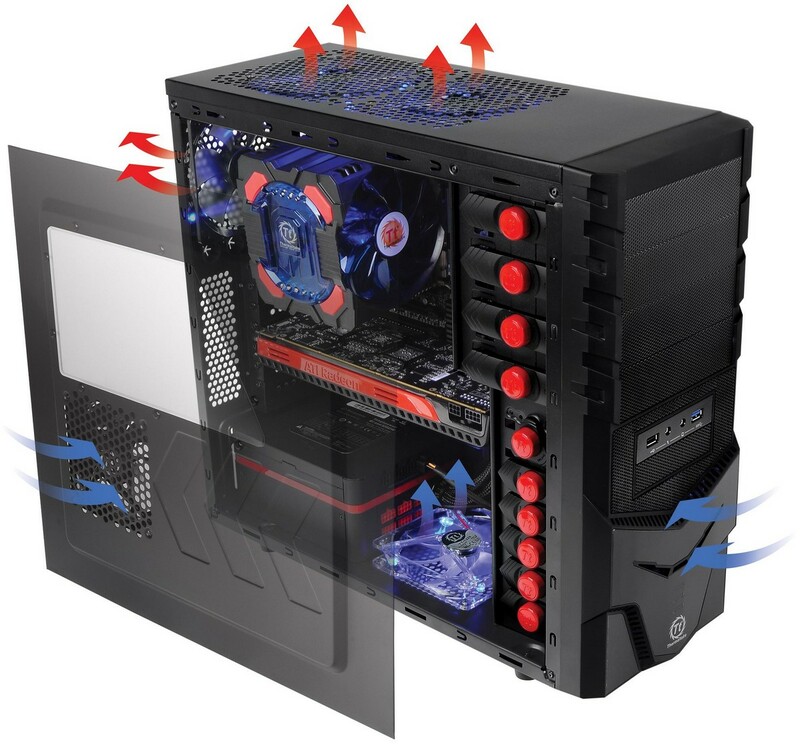 The superior cooling system of the【Spacecraft VF-I】mid-tower chassis symbolized the essential air element in the cyberspace, the gamers are under protection with the excellent ventilation while proceeding through space. Plus, pre-installed dust filters for fan, PSU and 5.25/3.25” drive bays which can avoid outside particles from finding its way into the power supply and chassis, also a removable and cleanable particle filter is positioned underneath the chassis, providing an easy access to keep Spacecraft VF-I clean. Furthermore, the unique tool-free and anti-vibration 5.25” and 3.5” mechanisms grant instant access and ultimate protection for【Spacecraft VF-I】mid-tower chassis equipments.